Jake Romanack of Fishing 411 records an interview with trout and salmon fishing legend Buzz Ramsey. Buzz designed the Mag Lip crankbaits that have become so popular coast to coast among trout and salmon fishermen. 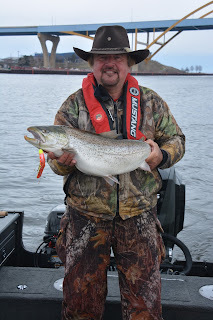 In an era when trout fishing success on Lake Michigan and other Great Lakes waters is in question, one port stands out as a “sure thing”. As the water of Lake Michigan gets cleaner and cleaner, this fishery is supporting less bait fish and unfortunately fewer game fish. The blame falls on a couple of evasive species known as the zebra and quagga mussels which filter plankton from the water. Collectively billions upon billions of these mussels are filtering the water of Lake Michigan to the point they can barely support a sport fishery. Clear water simply doesn’t support the necessary plankton and huge amounts of bait fish it takes to support a thriving salmon and trout fishery. 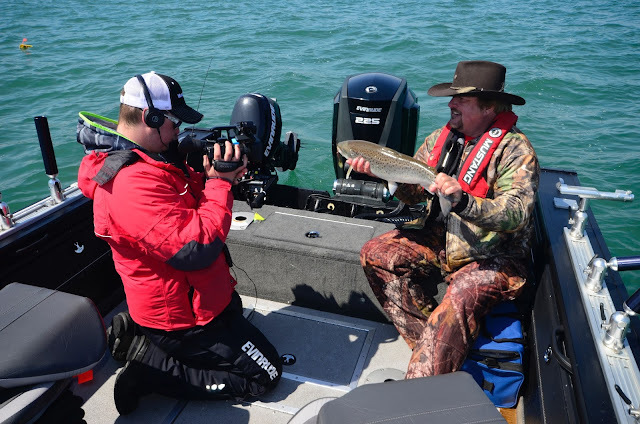 That’s the bad news and anglers up and down the Lake Michigan shoreline are singing the blues when it comes to targeting the salmon that made this lake famous. Salmon feed almost exclusively on alewives, smelt, ciscoes and gizzard shad, four species of bait fish that depend almost exclusively on zooplankton in the water. The clearer Lake Michigan becomes, the less zooplankton and bait fish these waters support. Plenty of bad news is flooding the media when it comes to Lake Michigan fishing, but fortunately not all the news is bad. Salmon stocking efforts are on a decline, but another popular salmonid species the brown trout is thriving in select parts of Lake Michigan. One port in particular has rapidly become known as the brown trout capital of Lake Michigan. Milwaukee, Wisconsin and the surrounding waters are near perfect when it comes to producing world class brown trout fishing. A protected harbor in Milwaukee allows anglers to access amazing brown trout fishing even on windy days. Nearby, power plants at Oak Creek and Racine, Wisconsin create warm water discharge sites that attract brown trout and other species in the winter and early spring. Unlike salmon, brown trout are more adaptive in their feeding habits. Browns have adapted to feeding on an abundant food source that ironically is also an evasive species. The round goby is a small bottom loving fish that thrives in Great Lakes waters by feeding on algae that forms on rocks and the eggs of other fish species. Some biologists estimate that the number of round gobies currently in Lake Michigan is far greater than the historic biomass of alewives! That’s a strong statement, but it paints a picture that while salmon numbers are declining, brown trout are a species that can thrive in Lake Michigan by targeting the round goby. Because the goby is a bottom dweller, the best brown trout fishing is also found in close proximity to bottom. The round goby avoids predators like brown trout by scurrying around between rocks and boulders on the bottom. Browns actually use their nose to root out gobies. Harbor weighs in at about five pounds. Fish up to 20 pounds are taken every year! Not surprisingly the best baits for catching these browns are diving body baits that do a good job of imitating the round goby. The Yakima Mag Lip, U-20 Flat Fish and Jointed Flat Fish are exactly the types of baits that can be used to dive down to bottom and wiggle their way to brown trout success. All of these baits are high action models that do a great job of imitating round gobies. Fishing these baits in proximity to bottom is important and can be achieved a number of ways. The Mag Lip is a deep diving crankbait and in many cases this bait can be fished deep enough to make contact with the bottom, simply by trolling the bait on 10 to 12 pound test monofilament. The Precision Trolling Data app confirms that the maximum diving depth of the 3.0 Mag Lip is 17 feet, the 3.5 reaches 22 feet and the 4.5 dives to 28 feet. Each of these baits can also be fished deeper by simply adding a one ounce snap weight on the line. Precision Trolling Data confirmed some years ago that adding a one ounce snap weight while trolling increasing the diving depth of popular crankbaits by about 1/3. In other words, a bait that is diving 15 feet will dive 20 feet deep when a one ounce snap weight is added. A third option is to fish these crankbaits using a three way swivel rig. The main line is tied to one arm of the three way swivel, a short dropper and lead sinker is added to the second arm and on the third arm a 60 to 72 inch fluorocarbon leader connects to the crankbaits. A two ounce sinker makes it possible to fish even the smaller sizes of the Mag Lip and Flat Fish on bottom in water up to about 40 feet deep! Normally these three way set ups are fished as flat lines on the corners of the boat. Harbor is stained to dirty. One of the ways to get more action out of Mag Lip and other high action crankbaits is to tie on a round nose snap to the terminal end of the fishing line and attach that snap to the round nose snap that comes standard on Mag Lip. Attaching a “snap to a snap” opens up the action of the Mag Lip and allows it to enjoy a “skip beat” action. This skip beat action mimics a fleeing bait fish and triggers strikes when other lures don’t. Mag Lip baits are also tailor made for fishing in combination with in-line planer boards like the famous Off Shore Tackle OR12 Side-Planer. Using planer boards anglers can fish two or three lures per side of the boat, covering more water and water depths in the process. When fishing diving crankbaits on planer boards it’s a good idea to set up the trolling pattern so the baits on the outside boards are fishing higher in the water column and the board closest to the boat is fishing deeper. This is easy to achieve by simply running shorter trolling leads on the outside lines and longer leads on the inside boards. This can also be achieved by running smaller and shallower diving baits on the outside lines and larger/deeper diving baits on the inside. Slow to moderate trolling speeds (1.5 to 2.0 MPH) produce the best action on brown trout. Unlike spoons and other traditional trout trolling lures, body baits have great action at all common trolling speeds. 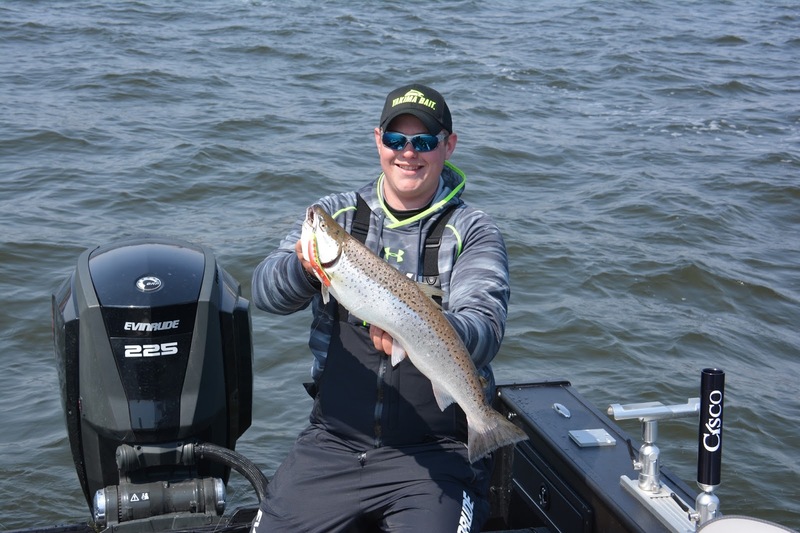 Anglers who want to experience brown trout fishing in the Milwaukee area will find that late March and the entire month of April are red hot. 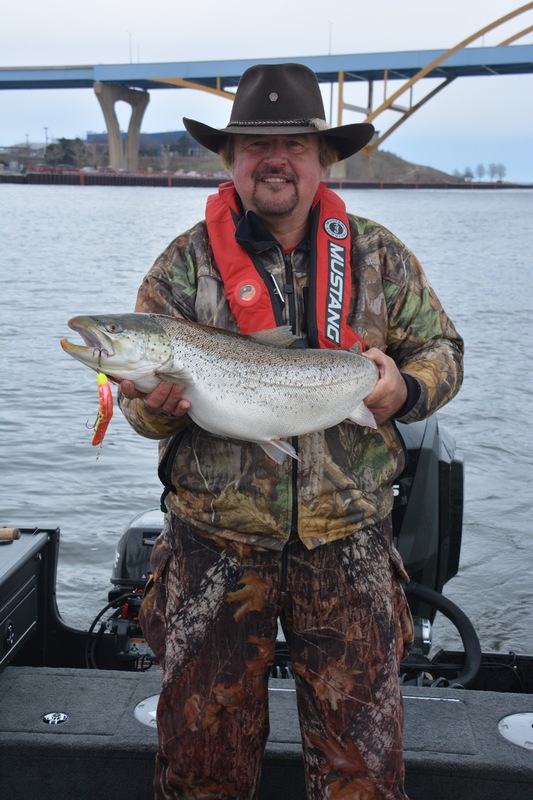 In early May browns are still available and anglers can expect a mixed bag of coho salmon. A local fishing tackle shop called the Fishin’ Hole always has a good assortment of lures and trolling gear. Located on Layton Avenue in Milwaukee, the owner Roger is an avid angler and big fan of the “Brown Town” fishery available in Milwaukee.